This recipe is traditional style, that bread that tastes buttery and the egg yolks give the color and richness to the bread. Anise and orange zest give this bread a unique aroma and flavor. The texture is soft and with a strong crumb to hold up dunking the bread in to a cup of hot cocoa! Enjoy! 2 teaspoons dry active yeast, equivalent to 1 7gr.package. 1. Measure and gather all your ingredients. 2. Start by warming the milk just about luke warm, add a teaspoon of sugar and sprinkle the yeast until blossom. About 10-15 minutes. The yeast should look foamy and creamy. 3. Meantime, on a clean flat surface make a “wheel” with the flour using your bowl to make a perfect circle. 4. Sprinkle the sugar around the flour wheel. 5. In the center add the eggs, egg yolks, spices, extracts, anise, cinnamon, salt. 6. Check on your yeast and if its ready add it to the center of the wheel. 7. Mix all this ingredients with a fork. 8. With your hand in a spider position, start incorporating little by little the flour from the edges. Be careful and gentle not to break the flour ring. 9. Start in circular motions all around the inner flour circle until you have fully incorporated all the flour and almost all the sugar. 10. Now using both hands start kneading into the butter. And at this point you can decide, mixing your dough by hand for about 20-25 minutes (which is hard work but I love the way the bread comes out tender crumb and the warm of your hands will soften the dough making it really smooth and shiny. Or using your mixer with a dough hook for about 10-15 minutes. Both routes work is just about preference and time. The key to making a good dough is to feel the dough. That’s why I prefer to mix it by hand. You can add up to 1/2 cup more flour if needed, if after a bit of kneading it feels to sticky, sprinkle 1/4 cup and knead, until your dough feels soft, smooth, fluffy. This dough is very easy to make and as soon is the right texture you will know. It will feel not sticky and it looks a bit shiny, as you can see on the last picture below. So be patient, give the love and knead gently and confident that everything will come out at the right time. 11. Once the dough is ready grease the inside of a bowl with butter and place the dough ball cover with plastic wrap and a towel and place it in a warm place over night. I’ve tried different methods and the bread did not come out as tender and buttery as traditional good bread. 10-12 hours over night is great. You can plan ahead and make it over the weekend. Wake up Sunday or Saturday and bake your bread and have it for breakfast with a cup of warm hot-cocoa or a coffee, cafe de olla. 1 egg slightly beaten, or those egg whites you saved when making the dough! 1. Punch your dough and reshape dough kneading gently and briefely. 2. Dust with flour a clean surface and cut dough into 4 equal parts. 3. Shape each part in circular motions. Until you have formed a round ball. Place it into a baking sheet lined with parchment paper. 4. Shape 3 parts and save one to make the bones and skulls for the tops. Divide this ball into 9 stripes and 3 small 1” balls equal sizes. 6. Brush the top of the bread with egg wash and then proceed to place the bone stripes, Egg wash it lightly. 8. Cover the tray with a piece of plastic wrap dusted with flour to prevent to stick. Let the bread rise for a second time for about 30 minutes. 9. Preheat the oven at 375F / 190C once the bread is in the oven lower it to 350F/ 175C and bake for 25-30 minutes. 10. Remove from oven brush them with the flour glaze and top with sugar, bake for 5 more minutes. Pull them out of the oven check the center for doneness. Sprinkle a little more sugar on tops and cool them on a rack. 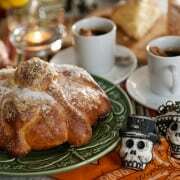 Enjoy your well deserved Pan de Muerto and Celebrate life!